I have grown very attached to the characters at Anchor Island, and the transient Will Parsons is no exception. She belongs there in a way she hasn’t belonged anywhere else—but there’s a reason why Randy calls her gypsy. Will Parsons is used to doing for herself and knows better than to accept help from anyone, a lesson she learned the hard way after the death of her mother. Now her code is to lay low and not make a scene; however, when a magazine journalist and a photographer come to the island to feature Anchor Island for some much needed tourist publicity, it’s very hard for Will to stick to the code. The usually unflappable, competent Will becomes very, very flappable, which lends itself to Terri Osburn’s signature humor. Randy Navarro is sublime beefcake, if you go for that sort of thing, and the most beta of betas in the best of all possible ways. He’s Zen. He’s vegetarian. He’s athletic and happy go lucky and just an all-around nice guy. Lately the only thing that’s actually making him mad is the fact that every time he gets around Will Parsons, she behaves as if he’s seconds away from doing a Hulk imitation and destroying everything around him, including her. He certainly can’t think what he’s done to merit such a reaction. Tying the two together is Beth, the heroine from MEANT TO BE, who is now planning her wedding and is giving a credible rendition of a Bridezilla. (Honestly, Will should be far more afraid of her.) Will takes on the task of keeping Beth’s wedding on track when Beth has a little health scare (she’s pregnant—terrifying!) and needs to relax. Randy helps Will, whenever, that is, Will is willing to be helped, frankly as little as possible, but the man is irritatingly handy. The wedding itself is going to take place in an area that Randy owns and has already detailed. Those people that Will doesn’t know, Randy does. She doesn’t want to spend time with him, as she makes clear time and again, but she’s not going to get far without his help. Will gets some rude awakenings that Randy is not some he-man Goliath without thoughts that don’t revolve around sports. The man’s helpful; he’s sensitive; and God help her, he’s incredibly hot. As a scene involving a jet ski will attest. 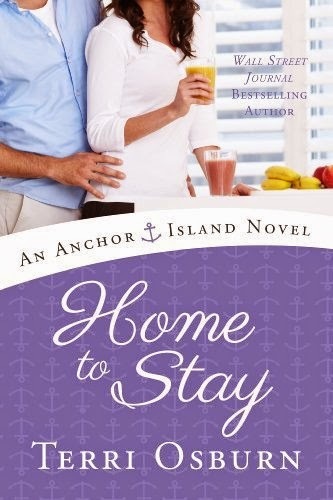 HOME TO STAY is a bit darker than its predecessors, but because it’s a contemporary romance, it stays true to its roots and doesn’t skive off into major romantic suspense and thriller episodes. Although Will came from an abusive relationship, there is not a black moment where the bad guy sneaks into her room while she’s sleeping, there’s a tussle, and he falls off the balcony to his death. Contrary to television fiction, that doesn’t always happen. But what it doesn’t have in overly dramatic showdowns, it makes up for with sweet and sassy characters, a spicy romance (did I mention the jet ski? The jet ski is important), and a satisfying ending. Well, mostly. I am glad that there will be a fourth book to show us what Beth is going to have and a little more entertainment among our favorite cast of characters. Anchor Island is a lot like the desserts at Opal’s—there’s no such thing as too much of a good thing. ...I totally agree. I love this series. I only just read #1 a few weeks ago and immediately had to read #2 & #3. I have been charmed by this island- reachable only by ferry- I have "Googled" the Outer Banks and thought of making a trek that way for a vacation which I think would please the author since she talks about doing that I her acknowledgments. I wouldn't mind a little jaunt to Ocracoke myself! But I'm all about ocean and beach and rum drinks. The best reviews are those like this one in which the reviewer has the intelligence and insight to give an opinion with which I am in total agreement. :) I love this book! Randy is my newest book boyfriend and one of my all-time favorite beta heroes. Like you, Hellie, I can't wait for another visit to Anchor Island. Thanks for the review, Hellie. Randy is one of the reasons why I enjoy my visits to Anchor Island so much. I hope we'll continue to see more of him in future books. I just read this book, too & loved it! Great series! Haven't visited Anchor Island yet, but it sounds like a worth while "trip."